In this paper we examine the large deviations principle (LDP) for sequences of classic Cramér-Lundberg risk processes under suitable time and scale modifications, and also for a wide class of claim distributions including (the non-superexponential) exponential claims. 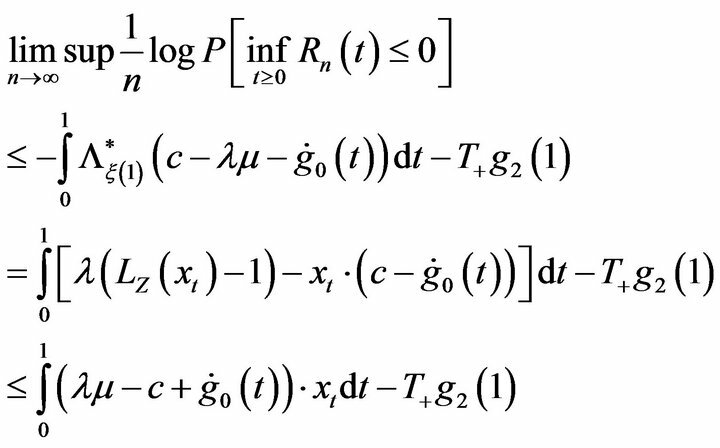 We prove two large deviations principles: first, we obtain the LDP for risk processes on with the Skorohod topology. In this case, we provide an explicit form for the rate function, in which the safety loading condition appears naturally. The second theorem allows us to obtain the LDP for Aggregate Claims processes on with a different time-scale modification. 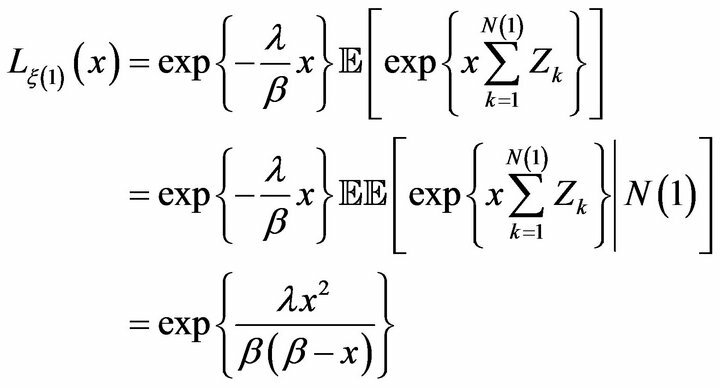 As an application of the first result we estimate the ruin probability, and for the second result we work explicit calculations for the case of exponential claims. There is a wide literature on Large Deviation Techniques and Applications. Relevant to this paper are results by Mogulskii (1993),  who proved a Large Deviations result for independent, identically distributed (i.i.d.) random variables with generating functions finite on a neighborhood of the origin. In , Lynch and Sethuraman gave large deviations results for stochastic processes with independent and stationary increments. The analysis was done on the space of functions of bounded variation on endowed with the weak*-topology. More general results were proved later, as Mogulskii and De Acosta did in [1,3,4] proving large deviations results for Lévy processes in very general settings. 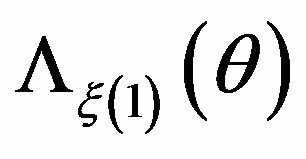 For compound Poisson processes, Li and Pechersky , following results by Dobrushin and Pechersky , proved the LDP for multi-dimensional compound Poisson processes defined on with respect to the vague topology, and then strengthened it to the weakuniform topology introduced in . The LDP for (reserve dependent premium with delayed claims) risk process was studied by Ganesh, Massi and Torrisi (2007) [7,8]. They proved the LDP with respect to the uniform topology in the case of superexponential claims i.e., claims for which the moment generating function is finite for every . Later, in , they illustrated the connection between risk processes and queues. 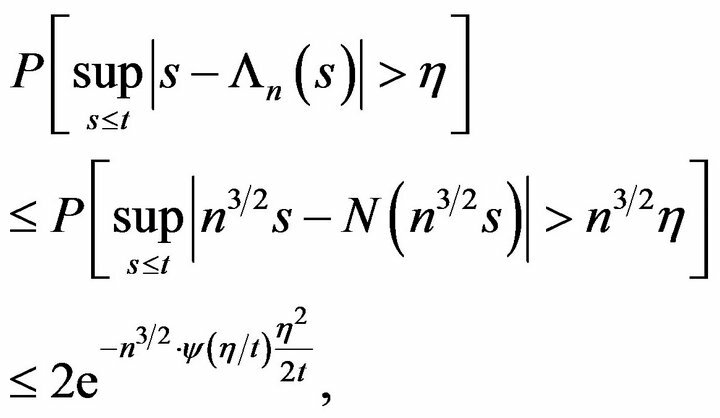 They applied their large deviations result (valid only in the case of super-exponential claims) to obtain an approximation for the probability of ruin and to propose an importance sampling parameter for simulation. The super-exponential claims are an interesting but very particular case, since distributions such as gamma (including exponential), Negative Binomial (including geometric) claims, are not of this type. 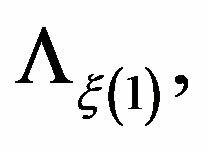 One way to deal with large deviations for risk processes is by proving the LDP for a sufficiently similar zero-mean Lévy process, and then using the Contraction Principle. That is the general approach we follow for Theorem 1: we examine the LDP for a sequence of risk processes with respect to the Skorohod topology under suitable time and scale modifications. We follow Mogulskii’s approach , whose results are based on Lynch and Sethuraman  to obtain an LDP for risk processes on and give quite explicit forms for the rate function. Another way to prove Large Deviations results is by first analyzing the compound Poisson component , via working with random walks or their linearized counterpart, proving the LDP, and then dealing with the random time via exponential equivalence of the times. In this direction there is work by Feng and Kurtz,  and our Theorem 2 for aggregate claims processes. 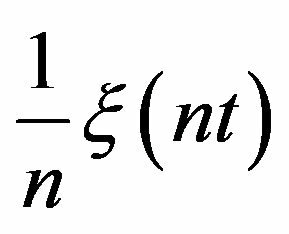 The difficulty with this approach is that a Poisson process could hardly be exponentially equivalent to a continuous one, and it becomes necessary to use a cumbersome change in time-space scale. We prove Large Deviation results for a wide class of claim distributions including the non-super-exponential case of exponential claims. 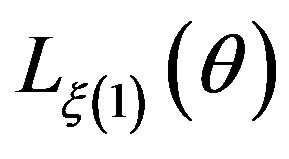 Although the vague topology is coarser than Skorohod’s, Li and Pechersky’s large deviations results do not imply ours (Theorem 1 below) because the space is not reflexive, and non-trivial exponential tightness should be proved first. On the other hand, we do not work with super exponential claims: we only need the moment generating function to exist on an open neighborhood of the origin, and for this reason our result is more general. Large Deviations techniques have been used to study ruin probabilities for risk process. A standard reference here is the book by Asmussen , references therein, and subsequent work by the author. On a generalization of the model, Asmussen, Klüppelberg, and Mikosch, in [11,12], studied asymptotic results for the compound Poisson process when the size of the jumps has a heavy tail (the moment generating function of the claims is on the positive real numbers). In this case, the large deviations theory does not apply, the results are quite different, and that is not the subject of this paper. 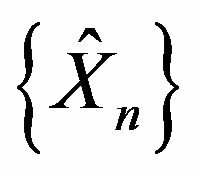 The organization of the paper is as follows: First, we have one Section to state the basic notation, to describe previous results, and at the end we have a small discussion about the precise shape of the rate function: that is Section 2. In Section 3, we state the basic Hypotheses that are needed all along the work. The main results, LDP Theorems 1 and 2, are stated in Sections 4 and 5, respectively. Both are proved in the same Section they are stated. Section 6 is devoted to the explicit calculations for the case of exponential claims. 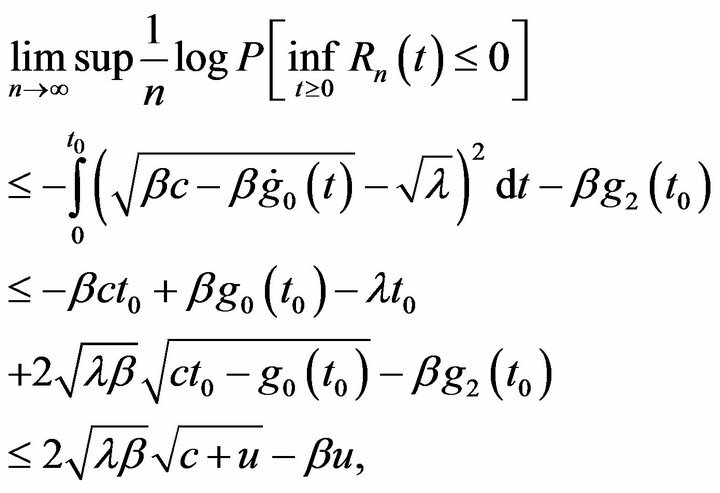 These calculations are combined in Corollary 1, and later used in Section 7 to estimate the probability of ruin for exponential claims, and also for more general claims. Let denote the interior of the essential domain for the Laplace transform (and its log-generating function) of where is a process to be specified. and the following will be our assumptions regarding this process1) is a Poisson process, , that models the number of claims received at time . accounts for the aggregate claims. 3) is the initial capital or reserve. 4) is positive. The term represents the (non random and linear) premiums the company charges. It is usually required to have a safety loading condition to assure ruin does not occur almost surely. 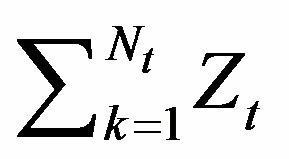 We do not need that condition for the moment; however, it shall appear when we give the explicit form of the large deviations rate function. 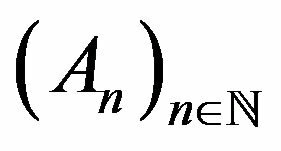 For each bounded variation with and , let be its standard decomposition such that , is absolutely continuous with respect to the Lebesgue measure (here denoted as ), is the Hahn-Jordan decomposition for the singular part of f with respect to the Lebesgue measure. Recall that and are hence non-decreasing, and each one is singular with respect to (which shall be denoted ). are non-decreasing, and with the understanding that If then the ULDP holds also with the uniform topology. In the next Section we shall state the hypotheses we need. 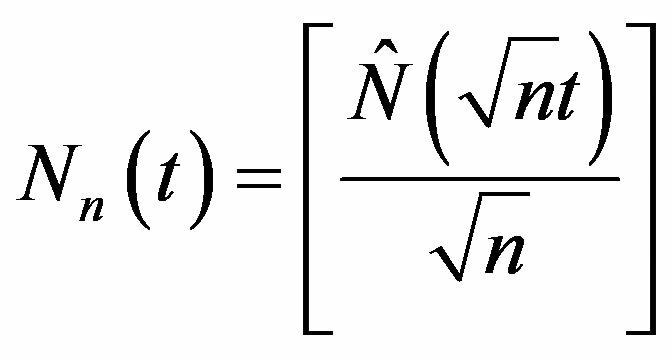 Let be nonnegative independent and identically distributed random variables with mean and second moment (i.e. Z is non-degenerated). 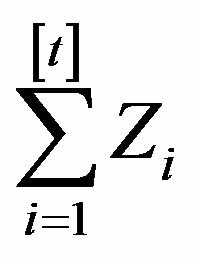 Let be a Poisson process with parameter defined on the same probability space and independent of the All our random variables Z, and Poisson processes will be as just stated, unless otherwise noted. Remark 2. 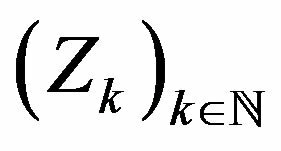 Finiteness of the function is equivalent to that of the moment generating function Condition 1 is satisfied if is finite for some (the negative part works due to Z being nonnegative). Notice also that this condition implies , and every moment of the variables are finite. Remark 3. 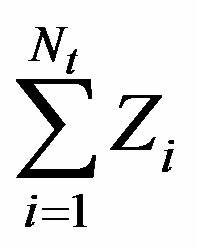 All the conditions on Z are satisfied if Z is, for example, exponentially distributed. This important case, for which many calculations can be made explicit, is discussed in Sections 6 and 7.
satisfies the LDP with respect to the Skorohod topology with rate function provided by 3. In this Section we prove the LDP for the process of aggregate claims, on a different space, with another time-scale parametrization, and using very different results. 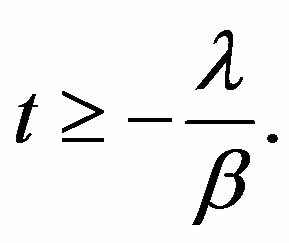 satisfies the large deviations principle in the space with the topology induced by the Skorohod distance. If is exponentially tight, then the LDP holds for if and only if it holds for . so Condition 2 also holds. Note that the exponent in our estimation also behaves as a polynomial on of first degree when is large. If the claims are not exponentially distributed, we can still make the following observation regarding the probability of ruin. Recall that the LDP proved in Theorem 1 holds for claims with moment generating functions much less restrictive than the super-exponential case. where the function is as in the statement above. We would like to thank both our universities CSUCI and UNAM, for their hospitality while doing this joint work. A. de Acosta, “Exponential Tightness and Projective Systems in Large Deviation Theory,” In: D. Pollard, E. Togersen and G. Yang, Eds., Festschrift for Lucien Le Cam, Springer, New York, 1997, pp. 143-156. Z. H. Li and E. A. Pechersky, “On Large Deviations in Queuing Systems,” Resenha, Vol. 4, No. 2, 1999, pp. 163-182. A. Ganesh, C. Macci and G. L. Torrisi, “Sample Path Large Deviations Principles for Poisson Shot Noise Processes, and Applications,” Electronic Journal of Probability, Vol. 10, No. 32, 2005, pp. 1026-1043. J. Feng and T. G. Kurtz, “Large Deviations for Stochastic Processes,” Vol. 131, Mathematical Surveys and Monographs, American Mathematical Society, Providence, 2006. S. Asmussen, “Ruin Probabilities,” Vol. 2, Advanced Series on Statistical Science & Applied Probability, World Scientific Publishing Co. Inc., River Edge, 2000. G. R. Shorack and J. A. Wellner, “Empirical processes with applications to statistics of Wiley Series in Probability and Mathematical Statistics: Probability and Mathematical Statistics,” John Wiley & Sons Inc., New York, 1986. P. Embrechts, C. Klüppelberg and T. Mikosch, “Modelling Extremal Events,” Vol. 33, Applications of Mathematics, Springer-Verlag, Berlin, 1997. *This work was partially supported by Projects PAPIIT—IN103606, IN117109 DGAPA—UNAM, and PAEP—2008, 2009—UNAM.